Nandina domestica (pronounced /nænˈdiːnə dəˈmɛstɨkə/) commonly known as heavenly bamboo or sacred bamboo, is a suckering shrub in the Barberry family, Berberidaceae. It is a monotypic genus, with this species as its only member. It is native to eastern Asia from the Himalaya east to Japan. Despite the common name, it is not a bamboo at all. It is an erect shrub growing to 2 m tall, with numerous, usually unbranched stems growing from the roots. 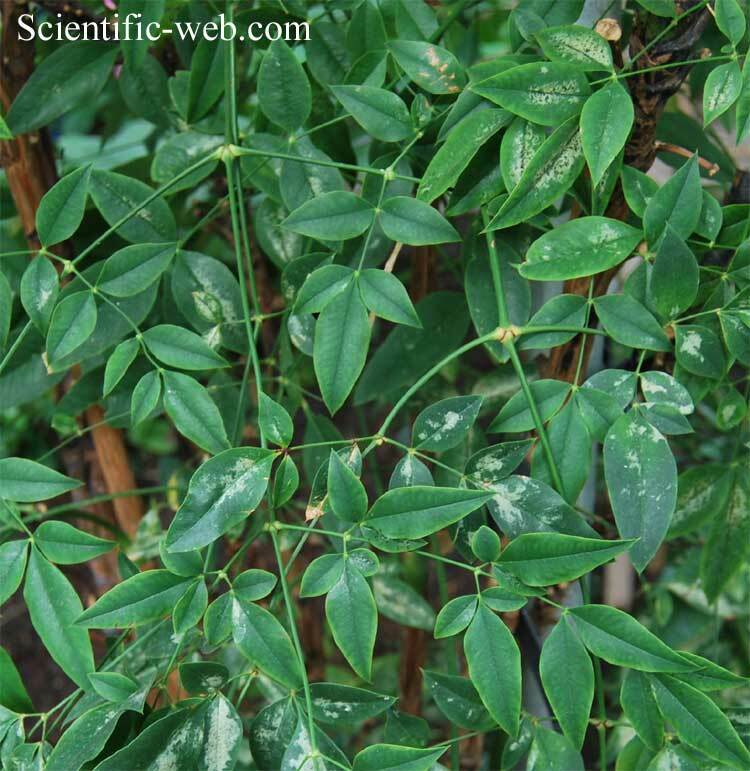 The leaves are evergreen (sometimes deciduous in colder areas), 50–100 cm long, bi- to tri-pinnately compound, with the individual leaflets 4–11 cm long and 1.5–3 cm broad. The young leaves in spring are brightly coloured pink to red before turning green; old leaves turn red or purple again before falling. The flowers are white, borne in early summer in conical clusters held well above the foliage. The fruit is a bright red berry 5–10 mm diameter, ripening in late autumn and often persisting through the winter. All parts of the plant are poisonous containing hydrocyanic acid, and can be fatal if ingested. The berries also contain alkaloids such as nantenine, which is used in scientific research as an antidote to MDMA. Birds are not affected by these toxins and will disperse the seeds through their droppings. It is widely grown in gardens as an ornamental plant; over 60 cultivars have been named in Japan, where the species is particularly popular. Nandina can be grown in USDA hardiness zones 4-10. Nandina can take heat and cold, from 110 °F/43 °C to 10 °F/-12 °C. It grows well in full sun to partial shade and requires moderate to low water. Avoid reflected sunlight in hotter climates. A true low care plant, nandina needs no pruning ever, unless it is to harvest some leaves for use in a flower arrangement or berries for a holiday centerpiece. You can also leave the berries on the plants for birds to harvest in late winter. Spent berry stalks can easily be snapped off by hand in spring. Due to the naturally occurring phytochemicals (see above) this plant is commonly used in rabbit, deer, and javalina resistant landscape plantings. "nandina". Oxford English Dictionary. Oxford University Press. 2nd ed. 1989. The unexpected pronunciation /iː/ approximates the Japanese nanten. 2. ^ Fantegrossi WE, Kiessel CL, Leach PT, Van Martin C, Karabenick RL, Chen X, Ohizumi Y, Ullrich T, Rice KC, Woods JH (May 2004). "Nantenine: an antagonist of the behavioral and physiological effects of MDMA in mice". Psychopharmacology 173 (3-4): 270–7. doi:10.1007/s00213-003-1741-2. PMID 14740148. 3. ^ Chaudhary S, Pecic S, Legendre O, Navarro HA, Harding WW (May 2009). "(+/-)-Nantenine analogs as antagonists at human 5-HT(2A) receptors: C1 and flexible congeners". Bioorganic & Medicinal Chemistry Letters 19 (9): 2530–2. doi:10.1016/j.bmcl.2009.03.048. PMID 19328689. * Huxley, A., ed. (1992). New RHS Dictionary of Gardening 3: 284-285. Macmillan.